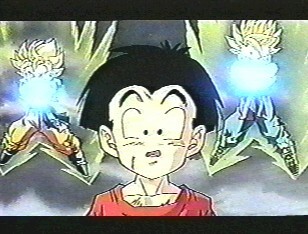 Krillin's been best friends with Goku since the original Dragon Ball series. 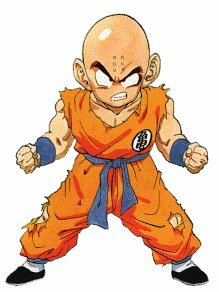 Although outclassed by most fighters in the series, Krillin always seems to be in on the major fights. He is known for being bald, and later wishes for hair as shown in the picture to the right. He marries #18 and has a daughter named Marron (NOT THE MARRON FROM THE GARLIC JR. SAGA).